Traditional Astrology and Astrological Magic by Christopher Warnock, Esq. A leading traditional astrologer, in practice since 1998. 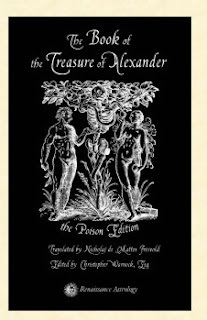 Book of the Treasure of Alexander Now Available! Ok, reception is another area where we can see change and simplification over the entire range of traditional astrology. The later Renaissance astrologers had simplified the medieval astrology of Bonatti who had already simplified the very complex early medieval Arabic teachings of astrologers like Abu Mashar and Mashallah. Reception is a good example of this, since by the 17th century reception simply meant two planets each in each others sign or exaltation or a combination of sign and exaltation. Thus the Moon in Leo and the Sun in Cancer, or the Moon in Aries and the Sun in Taurus, or the Moon in Aries and the Sun in Cancer. What me might call "17th century reception" is basically mutual reception, by the Renaissance reception and mutual reception have become synonymous. "...if some planet is joined with the Lord of the sign in which it is (or the Lord of the exaltation of the same sign, or with the Lord of the bound [term] or triplicity or face) whether by body [conjunction] or aspect, that planet who is the Lord of the sign (or some dignity of it) commits and gives his own disposition and nature and virtue to it. It is for instance true if it is joined with the lord of the domicile [sign] exaltation or two of the lesser dignities...but if it is joined only with the lord of the bound [term] or with the lord of the triplicity or with the lord of the face [then] the lord of those dignities or bounds by only one, does not receive him, because they are not of so much virtue that one alone can make reception without the help of another." Bonatti, Book of Astronomy, Tr III, chapter 13, Dykes trans at 223. (2) At least one of the planets in the dignity of the other. So, the Sun in Cancer and Moon in Leo would not be in reception according to this definition! 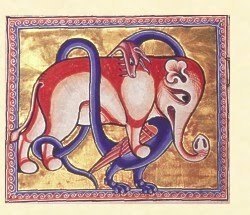 Instead in medieval style traditional astrology the Sun in Cancer and Moon in Leo is an example of generosity. See Abu Mashar, Abbreviation of the Introduction to Astrology, trans Burnett, (Arhat 1994) at page 28, note 1, citing the Abu Mashar's Great Introduction. Now we can get into all sorts of complex permutations of terminology, but I like the clarity of reception requiring an aspect and generosity simply indicating being in the dignity of a planet. Either way this these show a connection and/or special relationship between the planets that are in reception or in generosity and the people or things they signify. So what difference does reception make? Bonatti, in his section on horary explains that reception makes an aspect more positive, for example a trine or sextile, both good aspects, with reception makes things come easily, while a square with reception indicates it takes effort to get the thing or person desired, while a square without reception requires great trouble. Bonatti, Book of Astronomy, Tr VI, chapter 2, Dykes trans at 362. Ok, so this is how I explain reception and generosity. This is certainly not the only way, nor is it the "BEST" way since I don't think that there is one, perfect, best for everyone for all time method. Of course at the same time there are lots and LOTS of plain wrong methods! Essential and accidental dignity in astrology derives from a very key traditional philosophical concept, that of qualities that are essential to a thing and those that are accidental. For example, it is an essential quality of water that it is wet, as this is an essential quality, no water can be found that it not wet. However, being salt water or fresh water is an accidental quality because water can possess these qualities or not without altering its basic nature. Thus essential versus accidental dignity uses this basic philosophical concept though it is a bit altered in astrology. The essential dignity of a planet tracks its course through the degrees of the Zodiac, it is a measure of its basic power from very strong to weak to very afflicted. Accidental dignity is analogized to accidental qualities and includes things like angularity, (being angular, succeedent or cadent) benefic or malefic house placement (eg, 8th house is succeedent, but malefic) being combust, being retrograde, aspects to malefics or benefics, various conjunctions to fixed stars, house cusps or parts, etc. These are considered to be in addition to the basic power of planet as expressed by its essential dignity. You can see how Lilly splits up the essential and accidental dignities at Christian Astrology page 115. I agree with the split, if not with the way he has given points to many accidental dignities or the automatic tendency to start add up all these disparate numbers. More on this later! One possible way to consider this is to think of essential dignity as the qualities of the planet itself and thus the person or thing signified by it, while accidental dignity consists of qualities affecting the person or thing, but external to it. This is not a hard and fast rule, but useful in chart delineation. Thus we can see why Frawley would say that 2 peregrine planets interacting would be like 2 drunks or 2 sick people helping each other, because they have weak essential dignity. So let's do some more examples, dignified Jupiter applying to trine Venus in detriment, a rich friend helps out a friend in dire straits. A dignified Jupiter applying to oppose Venus dignified, a powerful man argues with an equally powerful enemy. Jupiter afflicted applies to sextiles Venus dignified, the poor man tries to help the rich woman, Mars dignified separates from a square Venus afflicted, the strong warrior leaves his distraught inamorata, &etc. Ok, the numbers game! In my discussions with Ben Dykes he has alerted me to the fact that the 9th-10th century Arabic astrologers were innovating like crazy. We had a recent discussion about the relative ranking of essential dignities which was in flux in early traditional astrology, but settled down as sign = 5, exaltation = 4, triplicity = 3, term = 2 and face = 1. Correspondingly detriment = -5, fall -4. Aphorism 13-A Planet in anothers house who rules the same Trigon, is as a man in the House or Castle of his friend. Aphorism 14-If Cadent from his House or Exaltation, he is as one absent from his abode. Aphorism 15-A Planet in his House or Exaltation, is as one in his Castle or strong hold. Aphorism 16-If in his House or Exaltation Retrograde, he is as a Sick man at home. These aphorisms give us much more useful information than simply saying 3, 5 or 4! Where we really go off the rails is starting to assign numbers to the accidental dignities. There is perhaps some value in a very basic sense of getting an idea of their relative strength and affliction, but assigning numbers then invokes an almost unbearable compulsion to start adding the numbers together. This is problematic with accidental dignities because unlike essential dignities they are very heterogeneous. Being angular is qualitatively not like being retrograde which is not like being conjunct Algol. Then we really run off the rails by adding in the essential dignity rankings. It is not unusual to get astrologers saying, "Jupiter is +21" or "Mercury is -7" which is not only much less illuminating than "Jupiter is in sign and triplicity, rising and trine Venus", or "Mercury is in detriment and cadent" but can be downright misleading. The key problem is that the accidental and essential dignities are so different from each other. Adding their numbers together is as fallacious as that old joke about making a camel & rabbit stew with equal amounts of camel and rabbit, ie one camel and one rabbit. As a very preliminary way to get a round about idea of approximate strength, numbers are fine for accidental dignity, but even with essential dignity, we risk losing nuance if we rely too much on numerical ranking. I am extremely pleased to be able to launch a new Renaissance Astrology publication, the Book of the Treasure of Alexander! Leafing through the Book of the Treasure of Alexander, we realize that the movie and other fictional depictions of magic and astrology are pale imitations of the real thing. This is a true book of magic, a real glimpse into the hidden spiritual powers scattered among all Nature. Here the ancient mages speak to us, truly revealing their secrets and the secrets of magic. It sounds incredibly romantic, but the reality is even better than the illusion! The Book of the Treasure of Alexander, attributed to Alexander the Great and his tutor, the philosopher Aristotle, is a medieval Hermetic text of alchemy, astrology and astrological magic. This is the first complete English translation of this key text, originally written in Arabic, which explains a wide variety of practical applications of occult virtue and the hidden powers of Nature. Originally written in Arabic, our text was translated into Portuguese from a critical edition of three Arabic texts and then translated by Nicholaj de Mattos Frisvold into English. I then extensively edited the text in order to make sure the astrology and astrological magic was accurate and usable. Despite being attributed to Alexander and Aristotle, Hermes Trismegistus and Balinus, our usual suspects when it comes to hermetica, pop up all over the place. This is a classic work of Arabic Hermeticism, with lots of links to Picatrix, but lots of new material, I've never seen either in Picatrix or other works. First off, the Book of the Treasure of Alexander has extensive new information on Arabic alchemy. There is a long, detailed step by step discussion of how to prepare various "waters" which culminate in the Great Elixir or Philosopher's Stone. What's interesting here is that the usual complex and often confusing symbolic language of alchemy is dispensed with and clear, step by step recipes are provided. Quite fascinating! The next sections are fairly controversial, in my opinion, because they provide a whole set of different poisons, including the "Royal Water", the "cold poison" and the "poison that kills through laughter". First off, many of the ingredients are difficult or impossible to obtain for the poisons and the instructions for these chapters are often confusing. These poison chapters explain why this book could have been referred to as the Mors Animae, the Death of Soul! Still, just a physician needs to understand the actions of poisons to cure, so too must the mage and the Book of the Treasure of Alexander has a whole set of corresponding chapters on antidotes. I was inspired, however, by these poison chapters to bring out an entire Poison edition! This is available only in hardcover or deluxe cloth bound, not in paperback, and includes the astrological poisons of Ibn Wahshiyya, most famous for his Nabatean Agriculture and a key medieval mage and scholar. These astrological poisons are really fascinating since they are said to work through sight and sound, not by ingesting the poisons! Very interesting astrological elections and even new planetary invocations are provided. Deadly, but very, very illuminating for the Hermetic scholar. If this interests you, get the Poison Edition, if not get the Standard Edition! What I am most excited about the Book of the Treasure of Alexander are over 30 new astrological talismans, none of which I have seen before with a whole set of new astrological talismans images from the original Arabic manuscript! Wow! One of the most interesting chapters includes planetary talismans made at the exaltation degrees of each of the planets. I've included the variant versions of the planetary exaltation talismans, but this set is new to me. We have new talismans for wealth, love, health, power, revenge and some fascinating city-wide talismans and talismans used for protecting huge swathes of territory. All very exciting, all new! We even have a new set of planetary invocations for Venus, Mars and Mercury accompanying its section on creating astrological statuettes. If you are at all interested in Hermeticism, alchemy, astrology or astrological magic, you need to get a copy of the Book of the Treasure of Alexander. This is an original text, straight from sages of the Middle Ages, silent for a millennium, finally speaking to us clearly and succinctly. My major concern as an editor and translator is produce a clear and usable text and the Book of the Treasure of Alexander is definitely that! The Book of the Treasure of Alexander is available in the following editions. All of the editions have an extensive introduction, appendices, over 120 footnotes and bibliography. All editions contain a variant source appendix with special planetary exaltation talismans. stamped gold leather spine label, hand made slip cover. Standard edition, 114 pages, decorated with alchemical sigils and symbols, $299.95 plus shipping. Poison edition, 134 pages, decorated with danse macabre images, including astrological poisons of Ibn Wahshiyya, $299.95 plus shipping. These are stunningly beautiful heirloom editions. Each one will be handmade specifically for the owner and can be specially dedicated to you by name. Planetary consecration (Saturn or Mercury are probably most appropriate) is available on request. (1) All pre-orders will receive a special pdf of the complete 28 talisman images from the Book of the Treasure of Alexander. 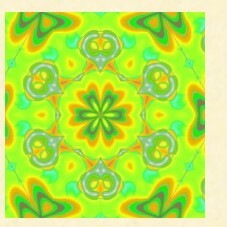 These images are magnified about 200% from the book and can printed out and used for personal talismans. (2) All pre-orders will receive a pdf copy of the seminal article on the Book of the Treasure of Alexander by the scholars that translated it from Arabic to Portuguese. The article by Alfonso-Goldfarb AM, Jubran SA., "Listening to the whispers of matter through Arabic hermeticism: new studies on The Book of the Treasure of Alexander" The article is in English and provides a fascinating scholarly look at the Book of the Treasure of Alexander and its history, particularly with regard to alchemy. (3) All pre-orders of the Poison Edition, whether hardcover or clothbound, will receive a pdf of the complete text with introduction of Ibn Wahshiyya's Book of Poisons! This is 130 pages, double column, and was released separately as a book. It is a complete Arabic medieval book on the subject of poisons. Ibn Wahshiyya was the author of Nabatean Agriculture and a key source for Picatrix. Whoa, definitely worth the pre-order! An incredible book and NOW, during the pre-order phase, is the time to order the Book of the Treasure of Alexander!